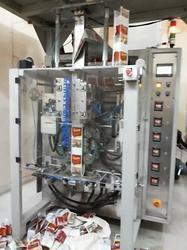 We have a strong image in the market as a manufacturer & exporter of Linear Weigher Based Pouch Packaging Machines. Incorporated with advanced electronic components, these machines are made in compliance with the needs of different industries. 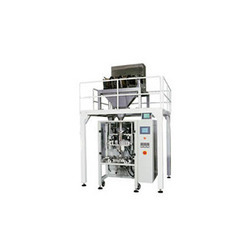 It is equipped with Single Head, Double head, Three head, four head, Ten head & Fourteen head weigher that make it suitable for weighing granules and powder. approx. 45- 50 pouches per minute. (also depends upon product to be filled). Approx. 35- 40 pouches per minute. (Also depends upon product to be filled). 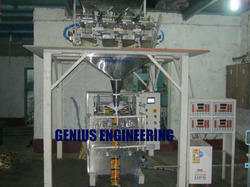 Ten Head multi weighing filler. (Multi weigh make). dry fruits, whole spices, tea, soya nuggets, pasta, macaroni, vermicelli, rice, grains, pulses, dry fish (bombay duck & prawn) & other granules. 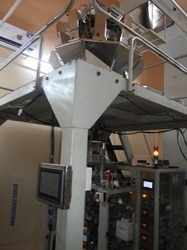 We are the manufacturer and exporter of Automatic Linear Weigher Filling Machine or Automatic Collar Type FFS Machine with Linear Head Weigher that is Suitable to pack various types of granular products like dry fruits, soya chunks, rice, sugar, lentils, grains, kurkure, namkeen mixtures, tea, puffs, baby rings, chips & snacks etc in center seal PP/ LDPE bags. Available in single, two, three & four linear heads. Approx. 60- 70 pouches per minute. (Also depends upon product to be filled). Capacity Approx. 50 bags per min. We are engaged in manufacturing and supplying a wide range of Multihead Weighing Machine (Automatic Collar Type FFS Machine with Multi Heads Weigher). 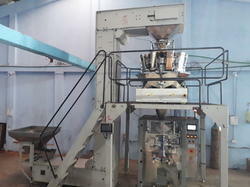 With the help of these machines we pack various types of granular products like dry fruits, soya chunks, rice, sugar, lentils, grains, kurkure, namkeen mixtures, tea, puffs, baby rings, chips snacks etc in center seal PP/ LDPE bags. such optional features like Controlled by PLC with color touch screen, AC Servo drive / AC Inverter drive for pulling paper. 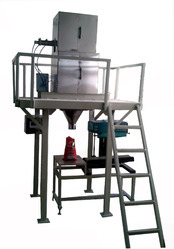 We Manufacture and export Automatic Net Weigher Filler Machine (Automatic Collar Type FFS Machine with Net Weigher Filler) that is Suitable to pack various types of granular products like rice, sugar, lentils, grains, tea etc in center seal PP/ LDPE bags. 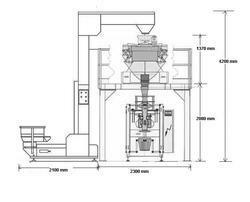 And available in single, two, three & four heads net weigher filling system. 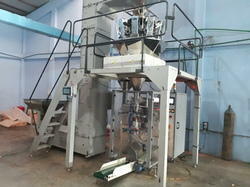 Automatic Collar Type FFS Machine with Net Weigher Filler is designed in accordance with the international quality standards. Our Two / Three head linear type weighing filler with stand is a suitable machine to fill dry fruits, soya nuggets, snacks, frames, rice, grains, sugar, lentils, seeds, vermicelli, spray dried detergent powder in pre-formed pouches & bags. Packing range: 1Kg to 5 Kg/ 5Kg to 10Kg. Production speed: Approx. 10- 12 bags per minute. (Depends upon quantity & product to be packed). Pneumatic Components: Festo/ janatics/Pneumex make. Main Stand: MS Fabricated/ SS- 304 Fabricated. Weighing controller: Digital (Marvel Make). Man Power required: Two person. 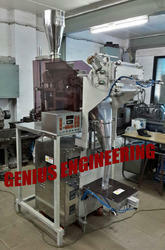 Our Two / Three head linear type Net weighing filler with stand is a suitable machine to fill Tea, soya nuggets, rice, grains, sugar, lentils, seeds, spray dried detergent powder in pre-formed pouches & bags. We manufacture different type of Pneumatic FFS Machine/Automatic Pneumatic Type FFS Machines with linear head weigh fillers. That is Suitable to pack chips, snacks, namkeen, soya chunks, seeds, tea, sugar, supari, puffs & pulses center seal pouches. Also available in single, two & three heads.